The Davis Science Café will begin its 2015 season pairing birds with wine—but not in the way you’re thinking. 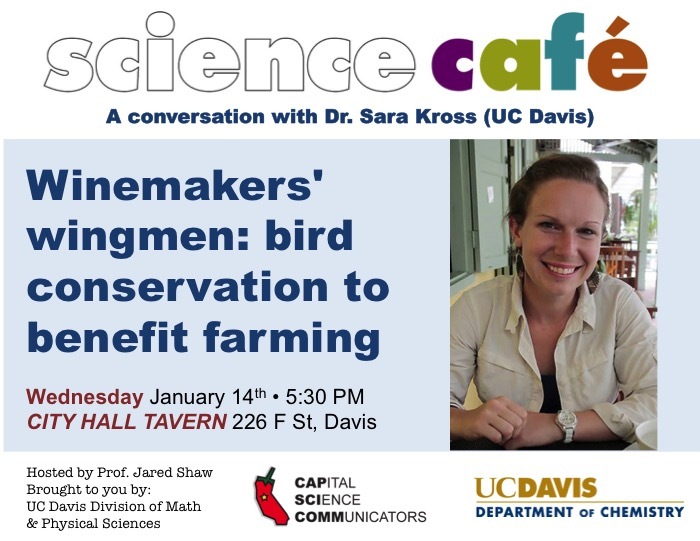 Our conversation will be led by Dr. Sara M. Kross, a 2013 David H. Smith Conservation Research Postdoctoral Fellow at UC Davis and The Nature Conservancy. Dr. Kross will explain her research exploring how wild birds can be managed and conserved to improve pest management in agricultural fields. She completed her PhD in zoology at the University of Canterbury in New Zealand, studying the impact of reintroducing the threatened New Zealand falcon (Falco novaeseelandiae) into the vineyards of Marlborough, New Zealand’s largest wine growing region. Now at UC Davis, Dr. Kross is shifting her research focus to bird species and crops local to the Central Valley. Check out her website to learn more, and follow her on Twitter at @Sara_Kross.